Media artist, Felix Deufel plans to capture the city’s soundscape, lead a 3D audio workshop, and present audiovisual performances in collaboration with local artists. Field recordings are his daily life - in Bangalore too. © Felix Deufel Spatial Sound Wave (SSW) at the Fraunhofer IDMT and participated with prize-winning projects in Fulldome Festivals. Ever since, he works intensively with 3D Audio as format and medium for different purposes. In 2012 he founded the artist collective Ciao Kakao in Darmstadt and club and venue tour with the interactive light installation Alienature, 2013/14 artist-in-residence at House of Natural Fiber (HONF) in Yogyakarta, Indonesia – projects, among others: Laszlo ambient/noise performances, Acrobotics, interactive bio hacking exhibition in collaboration with HONF in Jakarta, and Im Walde, interactive, audiovisual installation at Proto:type Y2014, Yogyakarta. Since 2013 close collaboration with Paul Schengber as Wisp Kollektiv. Their first work was ClinK, where interactive behaviours of spectators, in respect of 3D audio and 3D visual surroundings were explored and tested. The installation was among others shown on Node Forum for Digital Arts 2015 in Frankfurt and on Wisp Microfestival for Digital Arts in Leipzig. In 2016, Felix and Paul Schengber founded the Wisp Festival for Arts, Technology and Communication in Leipzig. The leitmotiv The stranger within us is based on Arno Gruen`s lecture about the loss of empathy in society. This subject was addressed and interpreted in several workshops, lectures, performances, concerts and an exhibition by more than 70 international artists. 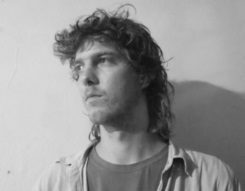 During the bangaloREsidency, Felix will lead a 3D audio workshop, work out audiovisual performances in collaboration with different artists and present them in a public event. The technical focus should neither dominate, nor force the artistic approach fade into the background, but enrich the artistic ways of expression as a new stylistic device. Field recordings are his daily life and in Bangalore too, Felix wants to capture the city soundwise. The recordings will be presented in a spatial audio performance or installation. 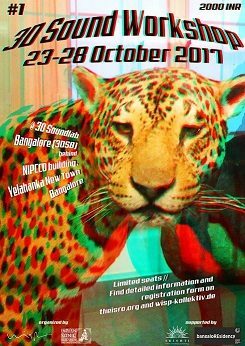 Invited byThe Indian Sonic Research Organisation (ISRO) and Goethe-Institut / Max Mueller Bhavan Bangalore, I had the chance to live and work as bangaloREsident in Bangalore for two months in September and October 2017. During my stay, I focused on my main project, the establishment of the 3D Soundlab Bengaluru and holding the first 3D audio workshop there. I also had the chance to collect a huge archive of field recordings and played two sound performances and a DJ set. Yashas Shetty, the head of the Art Science Lab Bangalore, as well as Umashankar Manthravadi, an expert in 3D audio recording techniques were a big support and great collaborators for my projects. I first considered bringing a 3D sound system to India to hold workshops and for performances, which was not possible for several reasons. Anyway, what would have been the benefit for artists to participate a 3D sound workshop and not have access to a 3D sound system afterwards? That was, when the idea came up of setting up a 3D soundlab in Bangalore, which would be freely accessible for artists, musicians, composers and audio engineers permanently. © Felix Deufel Two months for planning and building the lab was clearly too short a time, but I did not know yet how complicated it was to import equipment from abroad or even receive it on time. That was one lesson I learned soon: we never heard again about one order from China, another delivery was freed from the customs and UPS loops by a very patient workshop participant in the last minute before the opening event of the 3D Soundlab. Anyway the project was a lot of fun and went very well! 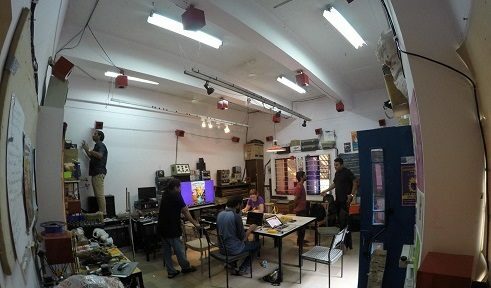 The rooms of the Art Science Lab Bangalore at Srishti Institute for Art, Design and Technology were generously provided as working space and I received strong support from the team. 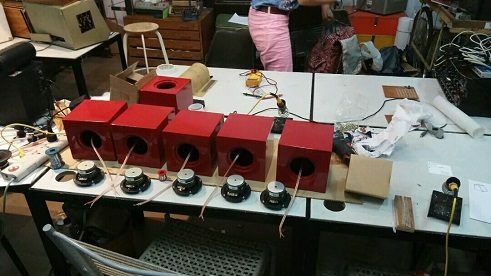 After we received and sourced all the components, such as loudspeaker drivers, cables, connectors and wood, the speakers and rack amplifiers were built and cables configured. © Felix Deufel We installed the system with 30 loudspeakers in the room and did the first soundchecks and tests. The system was ready for the workshop, which took place in the last week of October, with Yahsas Shetty and Umashanker Manthravadi as co-hosts. The results of the participants were presented and celebrated at the official opening event of the 3D Soundlab Bengaluru with many guests. All in all, seven performances and installations were presented, also Yashas and I presented our second musical collaboration, based on field recordings I did during my stay and improvisation on the piano. The event and the opening of the fully functional 3D Soundlab was a very special moment for me and a great finale to my bangaloREsidency! On my way through the city and on other trips, I collected a lot of field recordings, some in quadrophonic and some in stereo format. Step by step, I will analyse those recordings, cut and name them and build up my personal India/Bangalore sound archive. Thanks to a five-day trip out of town, I was able to collect characteristic sounds of rural areas as well as the seaside and the city of Bangalore itself. I will use the sounds for compositions and performances. A big Thank You again to all my supporters for your help and the great time!